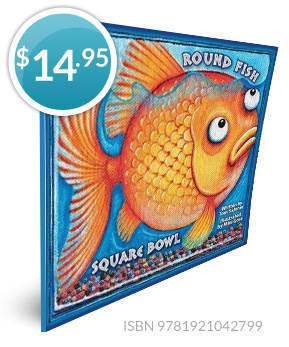 Round Fish Square Bowl lovingly addresses this issue in a charming and positive way. A Children's Picture Book (Ages 3-11) That Celebrates Being Different And Encourages Readers Of All Ages To Be Themselves. 2. Robust, intelligent, supportive...no, not me, the book! 5. Will become a childhood favourite, quick and easy to read, only 136 words. 6. Big, bright colourful pics for younger readers and easy text for older readers. 7. Adults will enjoy it too — they were once children and may still feel the same. 8. Promotes self-esteem and the advantages of being yourself. 9. Many levels of messages within the book — grace, courage, tolerance, resilience — as well as being entertaining. 10. Small price (A$14.95) for such an important lesson/support tool. Like a square peg in a round hole? Little kids and big ones too! Round Fish Square Bowl is a celebration of being different - 'Ugly ducklings turn into beautiful swans' - 'The tortoise beats the hare'. or have read to them, time and again, not just because of the storyline, but for its colourful, zany illustrations. Once again, New Frontier has produced a book which should be on every child’s bedside table and in every kindergarten classroom. This is a charming book with a wonderful message for children about being proud of their uniqueness.